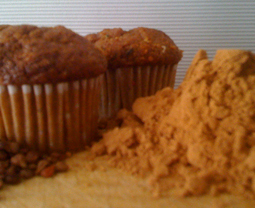 Gluten-Free Carrot Muffins - A recipe from Savor California, the online showcase for extraordinary gourmet foods and beverages from California. Prepare muffin tin with liners. In a large bowl, sift together the flours, sugar, baking powder, baking soda, cinnamon and salt. Whisk egg until foamy in a medium-size bowl. Add apple sauce and Salute Santé! Grapeseed Oil, then stir in the carrot, raisins and walnuts. Pour the carrot mixture over the dry ingredients. Mix until all ingredients are combined. Batter will be quite stiff. Spoon into the muffin tin. Bake for 35 minutes or until a toothpick inserted in the center comes out clean. Cool on a wire rack for 5 minutes. Remove from pan and cool completely on a wire rack.